Have you ever noticed that many people with dementia sometimes carry their walkers- instead of pushing it or lifting it forward and setting it down again? Consistent walker use is dependent on lots of factors, but most people in the early or middle stages of dementia who consistently use a walker have likely been using it for a long time. Likewise, if they have significant pain, they may be more likely to use it as it can alleviate painful, weight-bearing joints. But for a person with impaired balance and who is at risk for falls, expecting them to use a walker “because it’s safer” is just not a realistic expectation. Impaired judgment and insight limit a person’s ability to recognize “safety” as a good enough reason to use a device. Introducing any assistive device in the early or middle stages is difficult. The person may be able to demonstrate correct use during instruction, but will not remember the correct technique on his or her own. 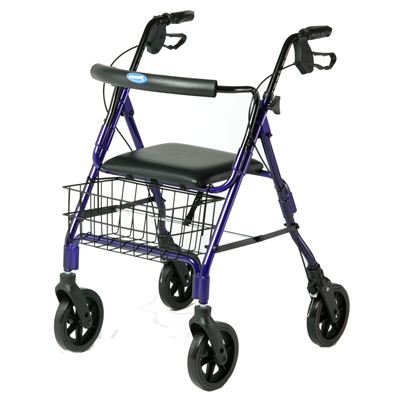 From my experience, the best device for most early or middle stage people with impaired balance is a rollator- a four-wheeled walker with a basket and a seat. Rollators are too heavy to carry, and handy enough to warrant consistent use. And the seat works great for sink level tasks in the bathroom where fatigue in standing may be a problem. Middle stage folks who have a penchant for hoarding or rummaging will like the rollator as they can use it to collect and transport their goods. This is a good thing- it encourages consistent use. So load it up with “treasures” and see if consistency improves. Rollator devices, as will all assistive devices, should be introduced by a physical or occupational therapist who can give professional judgment about whether or not the person is safe with a walking device. Nice quick but detailed overview on rollators!